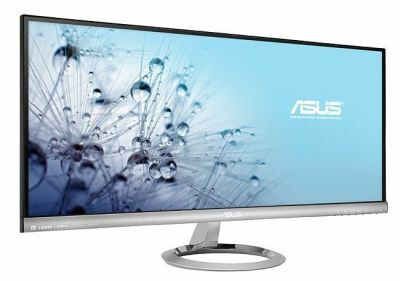 The monitor has an AH-IPS panel with LED backlight and a resolution of 2,560x1,080 pixels, dynamic contrast ratio of 80 million to 1, and a brightness of 300 cd/m2. MX299Q comes with six profiles of image display within Asus Splendid Video Intelligence technology (standard, games, movies, etc.) and integrated SonicMaster sound based on Bang & Olufsen ICEpower MobileSound 3 chip and 3 W stereo speakers. From video connectors there are DisplayPort, DVI, HDMI and MHL. Asus also highlights elegant design for which the got CES Innovations Award in 2013 with a thin rim and profile of 16.4 mm at its thinnest part. Price of the MX2900Q monitor is about $600.